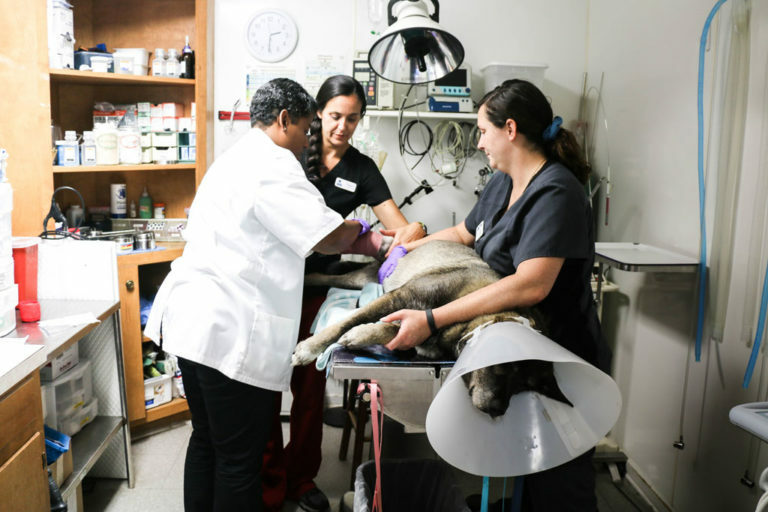 We are a full-service, modern animal hospital offering the highest quality veterinary medicine in a pet-friendly atmosphere in North Charleston, South Carolina. In addition to diagnostic and preventative services, our hospital is equipped with conventional radiography, digital dental radiography, in-house labs, and ultrasound. We’re focused on making sure our hospital has the right tools to allow our doctor and medical staff the ability to provide excellent service and care. A chameleon. These animal are highly adaptable and can change to suit the environment around them. Its kind of the same with AHONC. We are on the verge of some really exciting changes that will allow us to offer the community around us better services, better medicine, and better technology. “Our leadership team promotes a happy and healthy working environment. We have an open door policy that fosters respect, kindness, and are given the ability to think and problem solve for ourselves. We laugh a lot, take great care of our clients, and promote a hospital culture free from drama that makes us different. Our medical director, Dr. Ingram, takes pride in practicing best medicine and giving the staff the tools and education necessary to follow her lead. We might be a bit biased, but we’re a quick 25 minutes from one of the best US cities to live in: Charleston. Explore a little history, spend a day with your feet in the sand at Folly Beach, stroll through Boone Hall Plantation, or enjoy a bit of BBQ. There’s a little something for everyone!